A man is sleeping on his boat in the midst of a solo journey through the Indian Ocean when he wakes to find it taking on water thanks to a collision with a loose floating shipping container. We don't know the name of this man, we don't know what his life is like, yet I cared for him and was heavily invested in his fate. Who he was before, who he is today, who is going to be years from now, none of this matters as I was watching the life drain from his body while lost at sea facing rough weather conditions with no salvation in sight. Writer/Director J.C. Chandor crafted something special here, asking an audience to connect with a man in a nearly dialogue free film and I did instantly, and a large part of this bond I developed with the work (despite no actual attempts to develop the character) was the brilliant performance of Robert Redford. The lack of emotional stakes that typically stem from external relationships in films such as this may have resulted in a slightly colder experience than, say, the depth of heartbreak and life-affirming joy that a film like Gravity brings to me, or the overwhelmingly beautiful connection to a God I rarely recognize in everyday life that was established thanks to Life of Pi, but I am appreciative of the bold filmmaking choices of Chandor. All is Lost is painful to watch because of the extraordinary realism and anguish portrayed by Redford, and it was done without hardly ever saying a word. 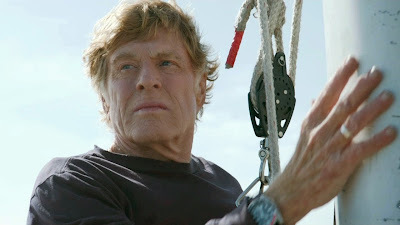 The pain in his eyes as he recognizes the slim odds of his survival and the crushing disappointment he portrays when the potential to be saved passes him by, at moments like these I was able to recognize just how challenging of a role this was and how perfect of a choice Redford was to fill it. It's hard to sell someone on a film like All is Lost. Prior to seeing it I had encountered multiple people complaining about how boring it was, but I cannot imagine being bored when the work of such talented people is on display.